Thanks to my wife and Doug’s watching of the NFL playoffs, it’s come to my attention that the Super Bowl is this weekend; that one of the teams playing is the Indianapolis Colts; and that the Colts’ quarterback is one Peyton Manning. As I listened to TV commentators talk about Peyton Manning, I got to thinking about a local Utah newscast that James D. Smith brought to the attention of the American Dialect Society listserv back in November. The story was about younger speakers there “dropping their T’s”. It turned out they were talking about the pronunciation of words like mountain and Layton (a city in Utah). The transcript wrote the pronunciations as “mow-en” and “Lay-en”, and when I first read it, I wondered what the big deal was. Among linguists, it’s well-known that in some varieties of American English, when you have a stressed syllable ending in a voiceless stop (such as /t/), a glottal stop [ʔ] is inserted before it. For example, here’s a spectrogram of me saying the word pate. (Click on it to make it bigger. I’ve also linked to a sound file — since I can’t embed sounds in the free version of WordPress — that you might want to open in a new tab or window.) The dark area labeled “ej” is the vowel; the vertical stripes correspond to the opening and closing of the vocal folds. As they approach he orange-highlighted area, they get farther and farther apart, as the vocal folds tense up and ultimately close. This is the glottal stop, labeled with a question mark because I couldn’t put the IPA symbol into the graphic. At some point during this 90 milliseconds of relative silence, I put my tongue tip into position for the [t], but that doesn’t show up: If the airstream is blocked at the vocal folds, another blockage downstream doesn’t make a difference. After the end of the orange-highlighted segment, you see a brief burst of sound, when I release the /t/. How do I know that orange segment really had a glottal stop in it, and wasn’t just all [t]? Here’s another spectrogram, of me saying pate again, this time making sure to keep my vocal folds open. This time, the orange segment containing the [t] is about 50 milliseconds long, which is average for American English. In the earlier pronunciation, the orange segment is about twice as long. But what does all that have to do with a “missing T”? The next well-known phonological phenomenon is that when you have a stressed vowel followed by a [t] or [d], and the next syllable ends in [n] (as in Peyton and Madden), it’s common for the vowel between the [t] and the [n] to drop out, and for the [n] in essence to act as the vowel. (In phonetic terms, it becomes syllabic.) It’s a labor-saving technique: Instead of putting the tongue tip behind the teeth to make the [t] or [d], then dropping it to let the vowel pass through, and then putting it back up there to make the [n]; you just put it up there and leave it. To make the [t], the tongue tip has to contact the palate right behind the teeth. Also the vocal folds have to stop vibrating, but since they’ve shut tight to make the [ʔ], this is already taken care of. For the [n], the tongue tip is already where it needs to be. Two other things have to happen simultaneously. One is that the uvula, which has been parked up against the back wall of the mouth, has to lower, opening up the passage to the nose. The other is that the vocal folds have to start vibrating again. If the silence of the glottal stop makes it hard to know when the tongue tip gets into position to make a [t] (as it did with the pate example), then who would ever know if it never showed up at all until it was time to make the [n]? All it would take would be for it to arrive a few milliseconds too late, and you’d end up with just [ʔn]. In fact, I still can’t tell for sure whether I pronounce Peyton as [pʰejʔtn] or [pʰejʔn]. 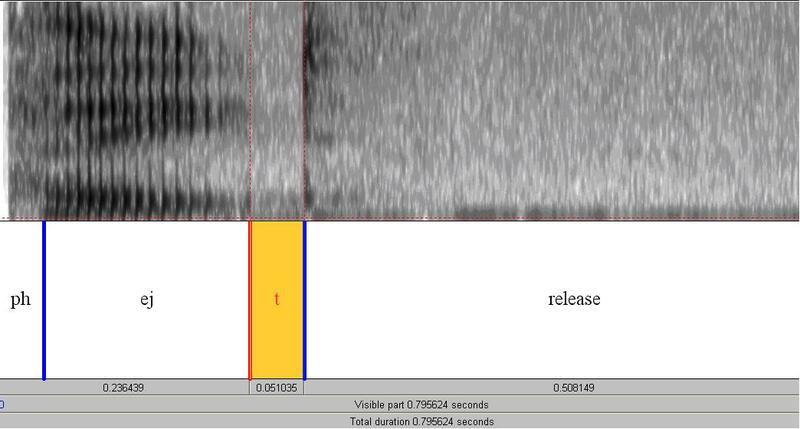 I’ve put a spectrogram of me saying Peyton below, and the glottal stop, conveniently highlighted in orange again, is similar to the one in my pronunciation of pate: about 80 milliseconds of silence. You can also see that there’s no vowel between the [ʔ] and the [n]. The voicing stripes are there, and so are the dark horizontal bands (known as formants) but much fainter than they would be for a vowel. This is characteristic of a nasal consonant. Maybe there’s also a [t] in there; maybe there’s not. But even if a listener can definitely tell that there’s no [t], this is such a common feature of American English that I couldn’t understand why someone would be complaining about it all of a sudden now, and for just this one population of speakers. I mean, it’s not bad English to pronounce Peyton as [pʰejtʰən], but it sounds a bit stilted and artificial, doesn’t it? 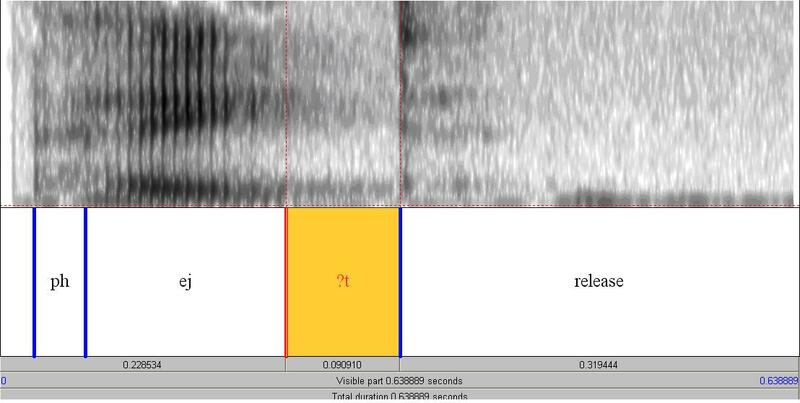 Below is a spectrogram of this careful pronunciation of Peyton, and the link to the sound file. 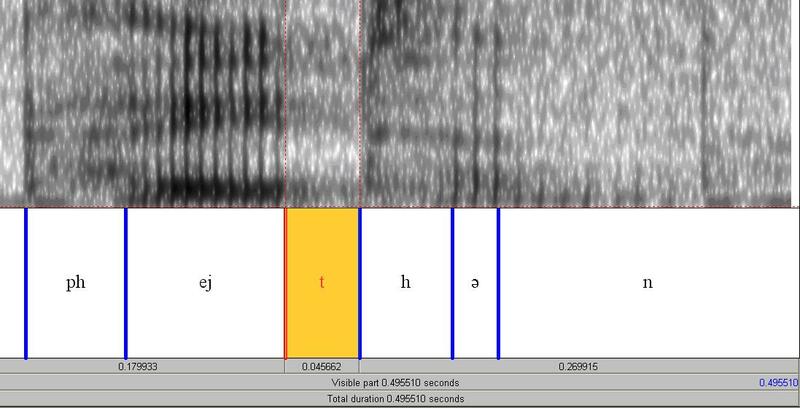 There’s no glottal stop here, just a 45-millisecond closure for the [t], followed by a slightly longer interval of voicelessness (noted as [h]), then a very short but visible and audible vowel before the [n]. So I finally got around to watching the news video, and when I did, I realized that people weren’t complaining about a glottalized-T-and-syllabic-N pronunciation; they were complaining about something that really was strange. There is indeed a glottal stop, and that’s not the strange part. And the actual [t] is missing; that’s not the weird part, either. The weird part is that the [n] doesn’t turn syllabic: The vowel before it stays! That is, they would pronounce Peyton not as [pʰejtʰən] or [pʰejʔtn] or [pʰejʔn], but as [pʰejʔən]. 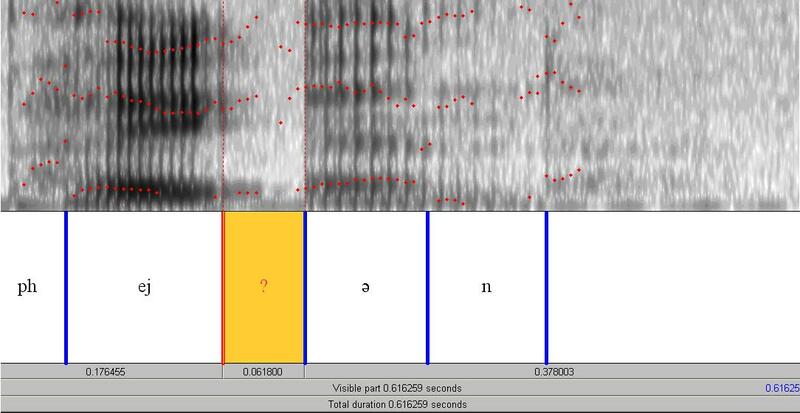 The spectrogram and sound file of me giving the “Utahan” pronunciation of Peyton are below. The glottal stop is a little on the short side, only about 60 milliseconds, but still a bit longer than my usual [t] closure. (Besides, I promise you, the tip of my tongue never touched the roof of my mouth until I said the [n]!) After it there is an unmistakable vowel, followed by the [n]. To me, this pronunciation is nuts! I first heard it on Dora the Explorer, when Dora was encouraging her audience to “push the buh-un”! This must have been near ten years ago, because it’s been a long time since Doug or Adam has watched Dora. Her pronunciation annoyed me, because the only reasons for the glottal stop to be there is if you’re going to say the [t], or if you’re going to do the [ʔtn]-reduction thing we talked about above. Now as a linguist, I know this position is untenable. 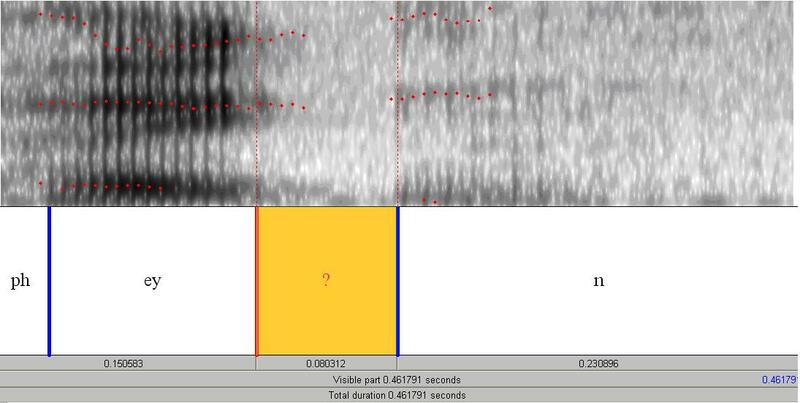 There are countless cases of some phonetic environment triggering a sound change, and then disappearing, like an icicle used as a murder weapon, leaving the sound change it caused as a puzzle for historical linguists to figure out. So why should this one be so weird? It shouldn’t, but speaking as an everyday user of English, I can tell you that it is, and I can totally understand the gut reaction of people who complain about it. I their real complaint is much like mine, but without the phonetic knowledge to put their finger on what’s going on, they seize upon the “missing T” — the [t] whose absence is hardly noticeable when an [n] comes immediately after, but which glares out when what remains is a glottal stop right next to a vowel. So what about mountain, which I’ve ignored after mentioning it in the first paragraph? That’ll have to come in another post, along with names like Horton, Clinton, and Thornton (but not Easton, Ashton, Piketon, or Clapton). In the meantime, if you find yourself having to watch the Super Bowl and wondering how to stay entertained, maybe you could listen for glottal stops and missing T’s when the commentators Peyton Manning’s name!